It’s fascinating to me what kind of equipment other artists choose to take when painting outdoors. We’re all looking for lightweight and compact, but at the same time we want all the familiar bits and pieces from the studio, just, you know, in case! So what do I take in my painting kit? 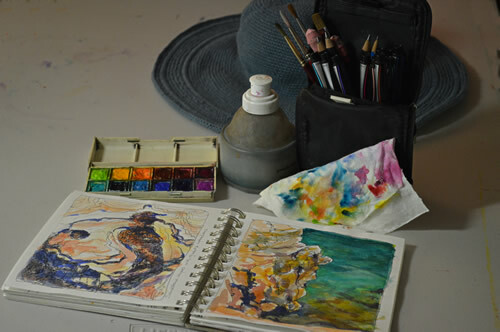 To start with, here’s my paintbox – the outdoor version. It has the same basic selection of paints as my studio palette, in half-pan sizes, topped up from tubes. 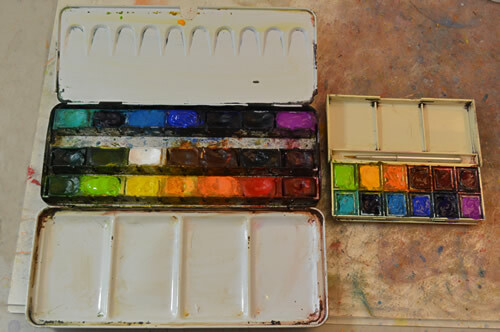 Now this is in a substantial metal box with a couple of mixing trays, but I also have a little rinky-dink version which is a plastic Cotman box with its original paints chipped out and replaced by artist quality paints. In this box I only have 12 colours, and I can only use small brushes, but it’s just perfect for hiking & sketching. 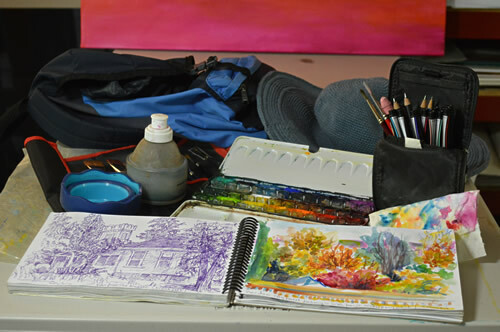 For the full plein air kit, I carry a collapsable water dish and bottle, a roll-up holder for brushes, various pens and pencils, eraser, tissues, sometimes watercolour crayons, a hat, backpack and a sketchbook or watercolour book/pad. And sometimes I also take a lightweight camping stool. 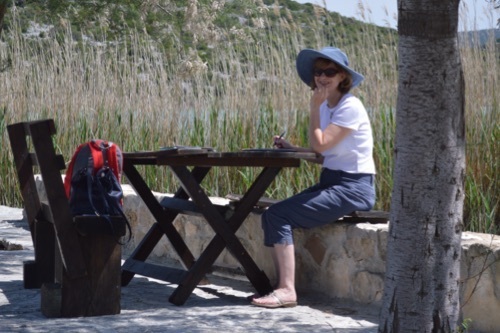 The hike & sketch kit is futher slimmed down to the small paintbox, a few brushes with pens and pencils, the collapsible water bottle, tissues, hat and a small sketchbook which all go in the backpack together with my sandwiches and some drinking water. Of course, some days it’s enough just to carry a sketch book and pen, especially if I’m out with someone else and don’t want to take the time to paint. My small sketch and some photos give me what I need to fill in the colours later, or as a base for a bigger painting. Great one I would love to try this..